This should be Twitter’s time to shine. In its 10 years of existence, the site has evolved from a curiosity to an indispensable part of the global communications landscape. If there were any doubts about its centrality to the pubic discourse, they’ve been dispelled by the current US presidential campaign. Donald Trump’s late-night binges on Twitter have driven the news cycle, political partisans are waging war across the platform, and emails released by Wikileaks show just how much care rival Hillary Clinton’s team puts into crafting her tweets. When asked about Twitter during the second presidential debate, Trump praised the service, calling it “very effective,” an unsolicited endorsement few companies would turn down. 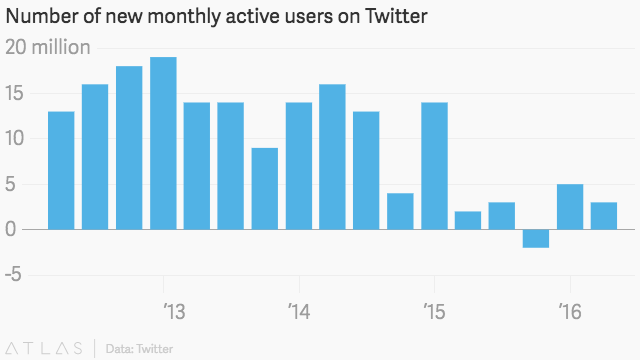 And yet, despite all its success, Twitter is looking more and more like a business failure. The company hasn’t had a profitable quarter in the three years since it went public, it was unable to find a buyer recently during a very public attempt to sell itself, and, according to Bloomberg, it’s now planning on laying off 8% of its employees, about 300 workers. More ominously, user growth is stalling. Twitter’s base of 313 million monthly active users has been little changed for about a year while social media peers like Facebook and Snapchat continue to grow. Many of Twitter’s problems can be blamed on management failures. The company has churned through senior leaders, including six heads of product in six years, and its co-founder and CEO Jack Dorsey was pushed out of the company in 2008, only to return as CEO last year. The disruption at the top has left Twitter without a clear growth strategy, and a confusing bundle of initiatives, such as streaming NFL games and buying Periscope. It’s also tinkered with its core product to make it more user friendly, for instance removing photos and attachments from its 140-character limits, and creating a Moments tab to display news. But Twitter has been slow to address the bullying on its site—and the racist, sexist, and anti-Semitic abuse that can be regularly found on the platform may have kept Disney from acquiring the company. Twitter may be caught in the dilemma faced by many technology companies: Its health depends on continued growth, yet there may be a finite universe of users. Certainly Twitter’s service isn’t for everybody. Most people with Twitter accounts don’t use them regularly, and as many as 44% of users have never tweeted, according to a 2014 analysis. In media, politics, technology, and entertainment, Twitter has become an essential tool. But anyone outside the conversation can be forgiven for wondering what all the fuss is about. Ultimately, Twitter may be less like Facebook than like eBay, a site critical for hobbyists but largely irrelevant for the rest of the world.